This page had 281934 visitors. We work with professional knowledge in short time and we always comply with the actual rules. We are reliable and work with taking the customer's interest into account. 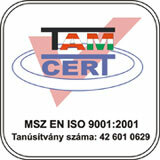 In 2006 our company has obtained MSZ EN ISO 9001-2001 qualification. Our work is done according to a controlled process, within a two-staged supervision. EWZ Ltd. has never paid quality, default penalty or indemnity and has never been ordered to do so in any legal or other procedure. In addition the company never had any onerous titles related to matured capital. Two of our leading experts are in possess of degrees and of the highest level expert qualification, with a more than 7 year old practice in banking appraisal and with a qualification for real estate valuation. The number of people working with us is seven. The more errands we run the more sub-contractors join our team. The work is done under supervision and it follows the previously prepared guidelines of the process. The supervisors that are the two leading real estate experts and the economic leader help the work of the employees.